It was quite a week for the league's leading forwards with five of the seven 10 million pound men all finding the back of the net at least once (the other two - Jesus and Zlatan - were not in action). Kane owners were feeling smug after his 13 point haul in the early game, only for him to be eclipsed by Morata and almost matched by Aguero later in the day, while Lacazette sent a reminder to the league that he is another talented option with a brace on Monday night. There is an emerging theory that one must own three of these elite options, and make up the difference elsewhere in your team with reasonably priced defenders and budget midfield options. While I understand this logic, I would not be so fast to dismiss the midfield elite with Sanchez and Hazard returning to their sides and the likes of Eriksen and Salah putting in quality performances every week. The wisdom of this argument will likely only be settled with hindsight. What we can review is which of the elite forwards should be targeted. While Morata stole the headlines, it was actually Aguero (and to an extent Lacazette who benefited from a penalty) who led the week in xP. This was perhaps to be expected given Aguero's opponent but it served as a welcome reminder that all else being equal, Aguero still likely has the potential for the most explosive points totals given the heights this City team have shown they can hit. However, the Argentine is also the most likely player in this elite group to be rotated and of course costs over a million more than Morata, Jesus and Lacazette. 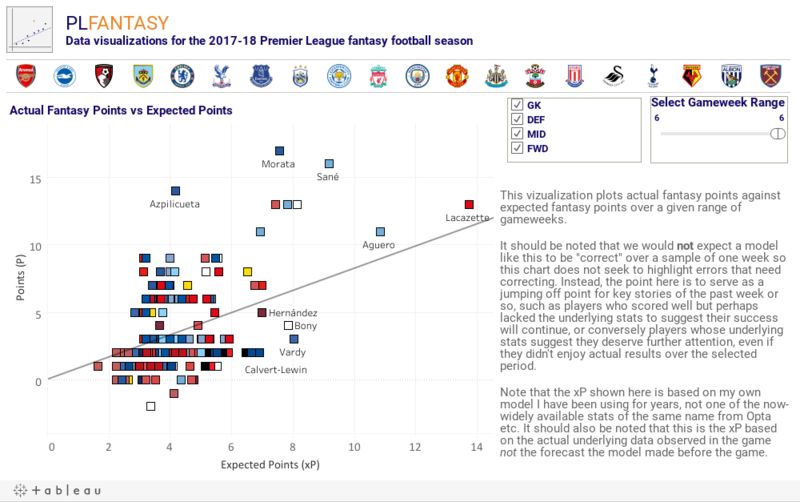 Through the next 12 gameweeks the model still has Kane as a clear leader followed by Lukaku and Aguero in a near tie. Jesus and Morata are then closer behind with Lacazette trailing by some distance. There's talent there for sure but given the Arsenal man's price tag, it's almost impossible to justify taking that flyer right now. One element that intrigues me about Morata is the share of Chelsea's shots inside the box he's accounted for when on the pitch (30%). No one else in the Chelsea team is over 16% which makes you feel very confident that if Chelsea have a weak opponent and the Spaniard plays, fantasy points are likely to come your way. The same cannot always be said for someone like Aguero who not only faces increased rotation risk but also has to share the spoils with more players when he is on the field (22% of SiB). Of course, if City keep scoring 5 and 6 goals a week there will be plenty of goals for everyone but when the scoring machine slows a little, one could argue that Kane (41% SiB), Morata and Lukaku (31% SiB) offer great certainty of success. In short, I believe Kane is close to a must own but could make an argument for any of the other group and wouldn't be scrambling and spending 4 point hits to flip between them regularly. For those not yet convinced by the three-elite forward option, a few players this week highlighted their own potential to round out your front line. Vardy and Hernandez have both been steady performers this season and while they certainly aren't unknowns (12% and 20% ownership respectively), they are sometimes forgotten men when compared to the elite group. I think it's too early to make a call on Bony yet, but there is a lot to like with Vardy and Hernandez. The problem is not so much these players, it's who they would be paired with. Presumably the rationale for downgrading from, say, Kane to Vardy would be to free up funds to use in midfield but of the top ten most expensive midfielders I would suggest that only Salah and Eriksen have been definite successes to date. If Hazard and Sanchez can return to form then they could offer just as much value as the elite forwards and thus a cheaper forward would be a useful, possibly essential, tool to give you access to them but until that happens it is indeed looking like the best bet might be to roll with three elite options. An alternative idea is to go with just two truly elite options and then stack your team with a host of second tier priced players such as Silva, Mkhitaryan, Pogba, Vardy and even the likes of Sterling and Sane (see below). This protects you somewhat from rotation and makes it easy to change direction during the season, though the captains armband becomes tougher to award and if you structure your team without someone like Kane, it can take two or even three transfers to free up the funds to get him back, so you better be sure you're happy with the direction (or have a wildcard to spare). Generally a prerequisite for fantasy consideration is being all but locked into a team's first team plans. Of course we know that the likes of Kane will still be dropped every now and then but we don't tend to tolerate fringe players who might only get 20-25 starts. Enter Sterling and Sane. The City pair rank 6th and 8th in points among midfielders and generally have the underlying stats to support their impressive hauls. At just 7.8m and 8.3m they are competing with mid-level options like Antonio, Sigurdsson, Pogba, Rooney, Benteke or Defoe and when playing, their advanced positions in such a dynamic team will surely help them eclipse this group. Though perhaps slightly more impressive when playing, Sane's lack of Premier League experience and numerous sub-appearances still make me nervous but I am convinced that the criminally underrated Sterling will get enough time to make him valuable. You will need to secure strong bench options though - which might therefore preclude you owning three elite forwards - but I definitely think there's a way to fit him into your side and offer a very reasonably priced way to get access to this talented City side. After this week's trip to Chelsea, City's fixtures are extremely promising and I would definitely consider having Sterling for 9/12 of them rather than many of the above group for 11/12 of their games.